On Wednesday March 23rd at 7 pm, at the Astoria Bookshop, 31-29 31st Street in Astoria, Queens, Ashwak Fardoush and Doreen Wang, both members of the Jackson Heights-based writing workshop The Diversity Writing Project, will read new, socially-engaged work relating to race, ethnicity and cultural identity, spanning from fiction to lyric essay. 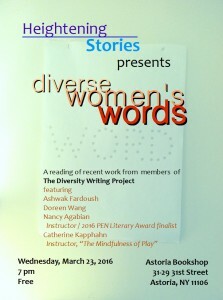 The Diversity Writing Project is one of Heightening Stories’s community-based writing workshops, founded by local author Nancy Agabian, who will also read from her novel, “The Fear of Large and Small Nations”, which was recently nominated for the 2016 PEN/Bellwether Prize for Socially Engaged Fiction. Joining the group will be writer/yoga teacher Catherine Kapphahn, who will be leading the workshop “The Mindfulness of Play” at Heightening Stories on April 16th. Ashwak Fardoush is a writer, a writing coach and an educator. She is also the founder of Roots & Wings: A Writing Circle. She leads individual coaching sessions and facilitates workshops to help writers venture into unexplored terrains in their writing. She is currently working on a collection of short stories titled At the Edge of Laughter. Her writing appeared in The Margins. Doreen Wang is a cisgender, queer Taiwanese American writer from Queens, New York. She writes poetry and creative nonfiction, among other genres, to contribute to the abundance and diversity of truths in our mysterious, complex world. She is a Kundiman poetry fellow. By day, she is also an office worker learning from and supporting China’s environmental movement. Doreen has a background in labor organizing, museum education and exhibitions, and searching for the Chinese diaspora in Latin America. And more than anything, she wants to hear your stories. Catherine Kapphahn’s writing has appeared in The Prague Revue, Astoria Magazine, the Feminist Press Anthology This is the Way We Say Goodbye, Wanderlust Review, Ars Medica: a Journal of Medicine, the Arts and Humanity, CURE Magazine and Sunday Salon. She is the recipient of a 2011 Individual Artist Grant from the Queens Council on the Arts. She earned an M.F.A in writing at Columbia University. Catherine teaches at Lehman College in the Bronx, where her students’ stories continue to inspire her. As a yoga teacher, she values the community of a class and enjoys helping students play energetically with the shapes and lines of the poses. Her dance background allows her to see yoga as an art form, a place to experience movement, rediscover play and lift the spirit. She lives in Astoria, Queens with her husband and two sons.